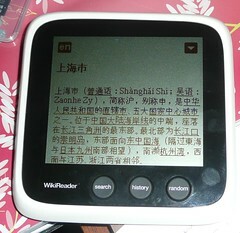 I recently bought a WikiReader and as I am about to visit Shanghai I am keen to load up the Chinese Wikipedia. 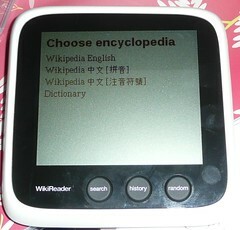 WikiReader also offers English Wiktionary and English Wikiquote, and no less than 13 other language editions of Wikipedia. WikiReader takes microSDHC cards and they are freaking tiny. 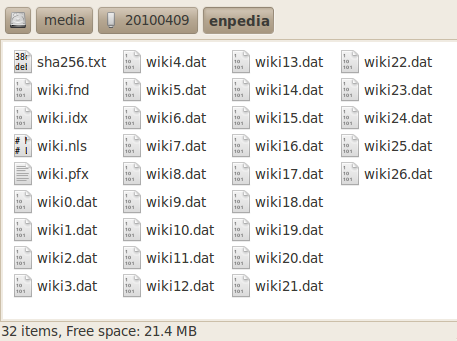 My WikiReader came with a 4Gb card and to fit multiple wikis on you would need more space than that, so at least 8Gb. I also needed a card reader to be able to put data on the card (my camera only takes regular SD cards and I don’t have a smartphone yet…). JB Hifi has a card reader for $25 (Soniq QMU62RB) and Officeworks has a 8Gb microSDHC card for $35. The 16Gb card is $75 which is pretty amazing when you remember the original price of this device is $100. The WikiReader runs on Forth. According to a page on the GitHub site, *.bmf files are fonts, *.elf are executables and *.4th *.4mu are “Forth related”. OK, so now to creating my own update. I downloaded all the files I wanted from the update page and then went about unzipping them. This wasn’t as straight-forward as I would have liked, as I am not very familiar with 7-zip and it seems its Linux tools are not as good as tar. For one thing it just wilfully destroys any directory structure the zip might have had. It also freaks out about “multi-volume archives”, which is apparently what five files called enpedia-20100622.7z.001, enpedia-20100622.7z.002, enpedia-20100622.7z.003, enpedia-20100622.7z.004 and enpedia-20100622.7z.005 constitute. This seems to be a known bug. I initially got around this by renaming my *.7z.001 to just be *.7z. This seemed to work, except for the enpedia ones. See? The moral of the story is, p7zip is a waste of time. There’s no need to pull out the big cat gun :) Just install 7-zip and extract the first (*.7z.001) file and 7-zip will handle the rest. Seems kinda magic to me… I don’t know if this is some standard feature of compression programs I’ve never run into before, or just a special trick 7-zip has. Can anyone shed some light there? Anyway whatever I seemed to work because I put my card back in my WikiReader and… voila! Before you type anything in the search, you can touch a “globe” icon to come to this screen, and then pick what project you want to search in. The two Chinese lines refer to different input methods.